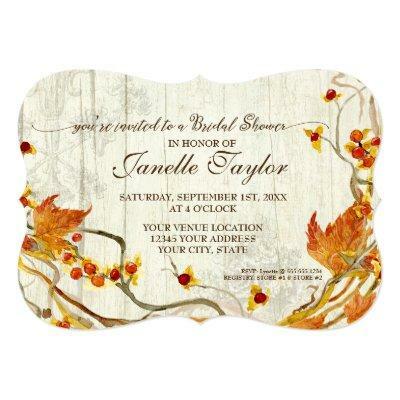 This invitation suite is a wonderful mix of refined, woodsy outdoor rustic and elegant romantic country chic! Starting with hand painted bittersweet vine with berries, red and gold maple leave and grapevine twigs, we then added a barn wood, wooden boards background in soft white and grey. The typography style text is in rich brown with hand lettered script calligraphy font elements. The reverse side is the wooden background boards and the full wreath with the bride and groom&#;s initials. Art copyright Audrey Jeanne Roberts, all rights reserved.